New subscribers easily gathering fair are opened! Yes, Membership nature can expand your subscribers list greatly! We had provided ability to subscribe your every new Membership user to any subscription list of MailChimp and Constant Contact engines. The more people to mail – the more benefit you’ll get. Membership Subscriptions by Supsystic allows you to gain more subscribers using MailChimp email marketing service! Grow your subscription list with Membership! With Subscriptions extension you can choose several subscription list at one time. Also there is ability to choose groups and skip the step of confirmation the subscription. 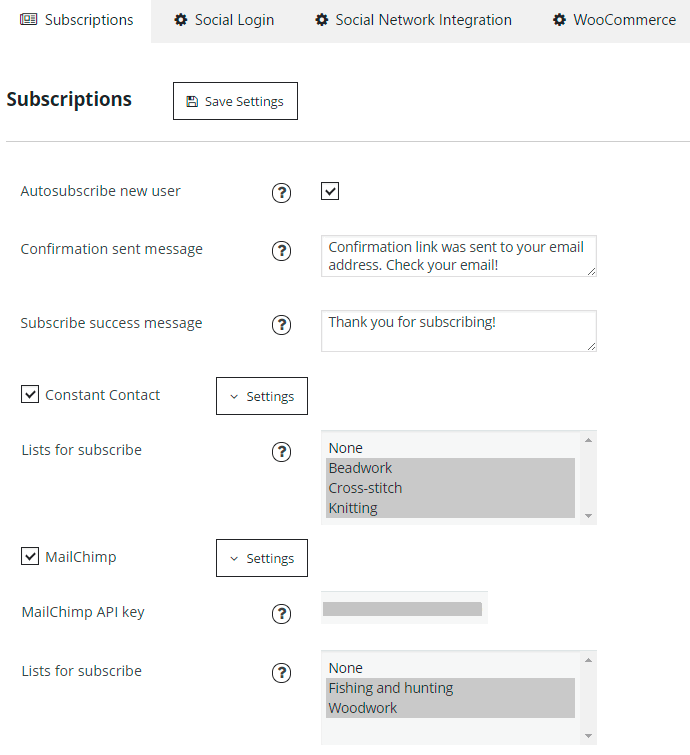 To subscribe to MailChimp you need enter your MailChimp API key and choose the list for subscription. To find your MailChimp API key – follow this instruction. What is the double opt-in in MailChimp Subscription? All MailChimp signup forms use the double opt-in process. Double-opt requires new subscribers to confirm their signup, so you know they want to receive emails from you. If you want to make subscription on your Membership site without confirmation - simply activate Disable double opt-in feature in Subscriptions settings for MailChimp service. Collect subscribers using Constant Contact mail service! In order to subscribe to Constant Contact you need to pass authorization – click "Authorize in" button and choose the list for subscribe from dropdown list (they are taken from your mail service account). That’s all! Extension allows to make subscription directly from User Profile Settings. 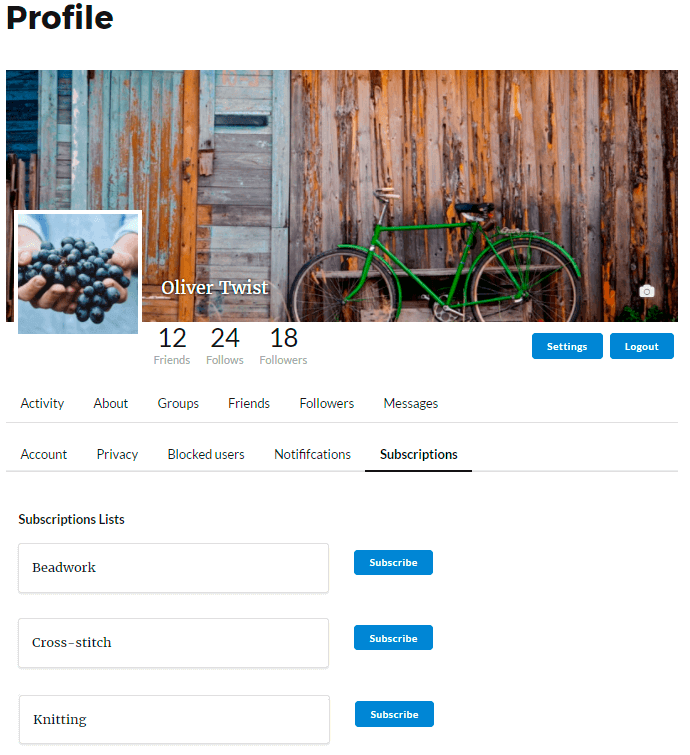 In Subscriptions section user will be able to subscribe or unsubscribe your email list. Read more information about Subscriptions here. With Membership Subscriptions addon you have ability to create subscriber directly after new user registration. If this option is disabled – new subscriber won’t be created for your subscription list after registration. In this case user will be able to subscribe in his Profile Settings. Autosubscribe feature is available for MailChimp and Constant Contact engines.